(This photo was submitted as a supplement for the FHS Softball Preview published on Wednesday, March 20, was not received prior to time of press and is being published with this story instead.) Front row (l-r): Megan Gragg, Lyndee Spargur, Kaiti White, Hayleigh Lowe and Lauren Arnold. Second Row (l-r): Assistant Head Coach Tom Purtell, Chloe Butts, Audrey Oder, Sadie Knisley, Autumn Avedisian, Morgan Sheridan, Harley Flint, Halle Hamilton, Allyce McBee and JV Coach Lesley Hattan. Third Row (l-r): Lynsey Smith, Molly Thackston, Caitlin Campbell, Taylor Lawson, Ashley Sanderson, Megan Crum, Layla Hattan, Gracie Lawson, Kiley Fauber and Head Coach Mark Dettwiller. Not pictured: Sara Knisley and Assistant Coach Kayla Dettwiller. 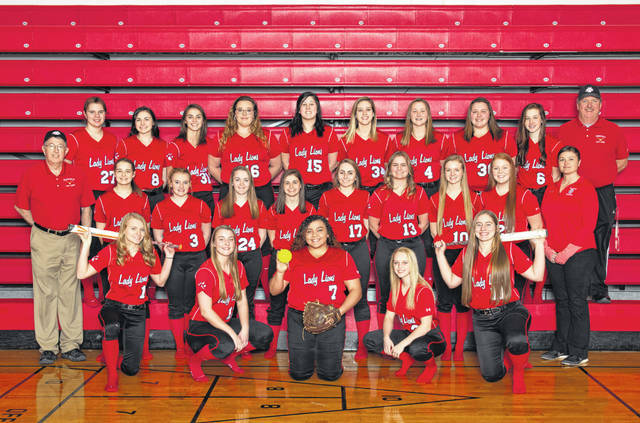 The Fairfield Lady Lions (1-0, 0-0 SHAC) opened the 2019 softball season in a big way with a 12-1 victory over the East Clinton Lady Astros. Kaiti White allowed just 2 hits while striking out 16 Lady Astro batters. The Lady Lion offense was equally impressive pounding out 16 hits including 5 for extra bases. Senior catcher Lauren Arnold led the offense with 4 hits and 4 rbi’s including a line drive home run in the top of the fifth inning. Senior first baseman Lyndee Spargur also had four hits and 3 rbi’s. Lady Lions’ ace pitcher Kaiti White was in mid-season form limiting the Lady Astros in just two hits while striking out 16 batters in the six inning contest. The Lady Lions played outstanding defense with just one error on the afternoon. The Fairfield Lady Lions wasted no time scoring 2 runs in the top of the first inning. With one out Megan Gragg lined a double down the left field line, and then advanced to third base on a wild pitch. Kaiti White drew a base on balls and Hayleigh Lowe entered the game as courtesy runner for White. Megan Gragg and Hayleigh Lowe then pulled off a double steal as Gragg scored and when the throw was wide of second base Lowe took third base. Layla Hattan then grounded out to shortstop to score Lowe. The Lady Lions added to the lead with a run in the top of the second inning. With one out, Ashley Sanderson doubled down the left field line and scored on a Lyndee Spargur single. The Lady Astros scored a run in the bottom of the fourth inning. Senior shortstop Taylor Boeckmann was safe on a bunt single and promptly stole second base. After a Kaiti White strike out, Kaitlin Durbin reached first base on a dropped third strike and Taylor Boeckmann took third base. Jericka Boggs then laid down a sacrifice bunt to score Boeckmann. The Fairfield Lady Lions then erupted for five runs in the top of the fifth inning. Kaiti White lead off the inning with base hit to centerfield. Hayleigh Lowe entered to run for White. Layla Hattan laid down the perfect sacrifice bunt to move Lowe to second base. Lauren Arnold then stepped to the plate and blasted a line drive home run over the centerfield fence. The Lady Lions would add three more unearned runs in the inning. Lyndee Spargur would have an rbi single. Fairfield would score four more runs in the top of the sixth inning. Kaiti White lead off the inning with a base on balls and Hayleigh Lowe entered to run for White. Layla Hattan singled and Lauren Arnold followed with a double to centerfield to drive in Lowe and Hattan. Autumn Avedisian entered as courtesy runner for Lauren Arnold. Taylor Lawson then doubled to drive in Avedisian. Harley Flint then entered the game as a pinch runner for Lawson. Two outs later Flint scored when Halle Hamilton was safe on an error. In the bottom of the sixth inning with one out, Taylor Boeckmann laced a triple to the right centerfield gap. But Kaiti White would strike out the next two Lady Astro hitters to seal the victory. Kaiti White was dominating on the mound for the Fairfield Lady Lions allowing just two hits while striking out 16. Leading hitters for the Lady Lions: Lyndee Spargur (4 for 5, 3 rbi), Lauren Arnold (4 for 4, double, home run, 2 runs, 4 rbi), Kaiti White (1 for 2, 3 runs, 1 rbi), Megan Gragg (1 for 5, double, 1 run), Layla Hattan (2 for 3, 1 run, 1 rbi), Ashley Sanderson (1 for 4, double, 2 runs), Taylor Lawson (1 for 3, double, 1 run, 1 rbi), Halle Hamilton (1 for 3, 1 run, 1 rbi). Kaiti White (1-0) was the winning pitcher for Fairfield. Kaiti’s Pitching line: 6 innings, 2 hits, 1 runs, no earned runs, no walks, and 16 strikeouts. Mackenzie Campbell (0-1) suffered the loss for East Clinton. Campbell’s pitching line: 5 innings, 12 hits, 10 runs, 6 earned runs, 4 walks, and 1 strikeout. Kiera Brightman’s pitching line: 1 inning, 4 hits, 2 runs, 2 earned runs, no walks, and no strikeouts. The Fairfield Lady Lions will host the Lynchburg Clay Lady Mustangs on Thursday, March 30th . Game time is slated for 5:00 PM . This story was submitted by Fairfield Lady Lions Assistant Coach Tom Purtell.